Striker who was named Polish Player of the Year in 2011 and 2012. He spent four seasons with Borussia Dortmund and two seasons with Lech Poznan before joining Bayern Munich in 2014. He played youth soccer for Varsovia Warsaw from age 9 to 16. He was the II Liga's top goal scorer while playing for Znicz Pruszkow in 2007. He was raised with a sister named Milena. 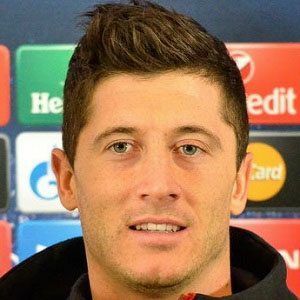 He married Anna Lewandowska in 2013. He and Anna have a daughter named Klara. He was joined by Marco Reus on Borussia Dortmund in 2012.